This page last modified 2017-01-04 01:08:23. For those on the timelocked server this NPC won't appear till Luclin, nor will his spells. He doesn't appear to be live on Time-locked progression servers. Posting this pre-kunark unlock. I looked around north ro zoneline area of Freeport, lots of empty barrels and very few npc's in the area. Please correct me if I am mistaken, since I would love to get some of his inventory asap. Nice, but listen for footsteps i was hearing some but didnt see, then Guard Altan (lol) attacked me prob standing in the minor ruin next to camp so just watch out hits max 150ish or so. He does not appear on the find list, but he is still near the gate to north ro. He's NW of the gate, standing next to some barrels. And he still sells all these spells. As of today, July 10th 2007, she does indeed sell this spell. I just now bought it from her, there is no question. Just checked East Freeport and Ainla does NOT sell this spell. Now sold in EFP by Ainla Yurimar. What is now sold in EFP by Ainla Yurimar? all of the above listed spells are. ainla is the new spell merchant. I found him right in the area where you zone to the Desert of Ro. Just go to the zoning area and he is on the left side... er west side. 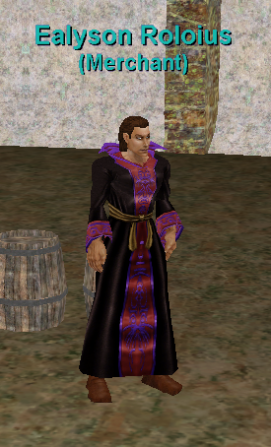 He is wearing the black robes of a necro with the red trim. NPC Missing on Prog Servers? I've not been able to find this NPC anywhere in freeport east. was he removed for the progression servers?